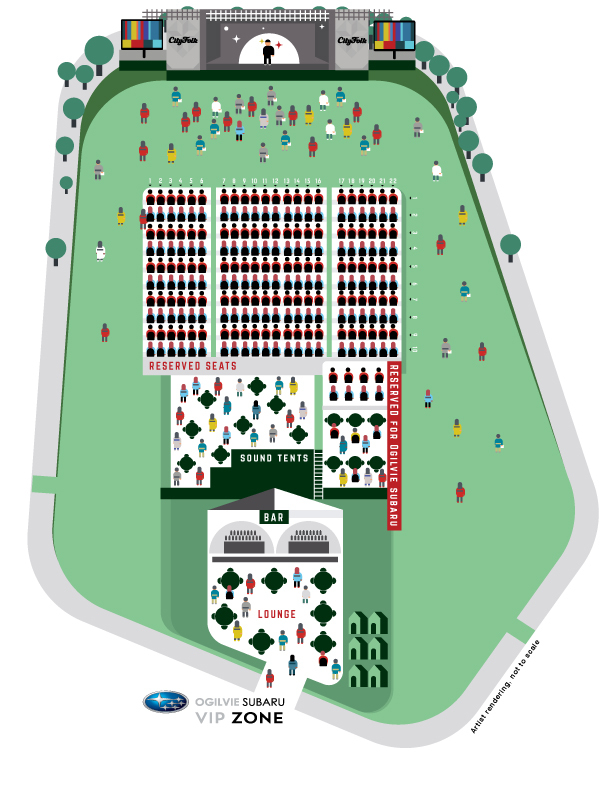 CityFolk is a general admission (GA) outdoor event held in Lansdowne Park (behind TD Place Stadium) and Aberdeen Pavilion (where the RavenLaw stage is located). Check out the directions! What is the festival atmosphere like? There’s more to CityFolk than music! We have vendors of all types, local craft beer, commemorative merchandise, promotions and contests, greening initiatives AND Marvest – a free event that collaborates with local businesses to spotlight Ottawa talent in unconventional venues. Visit the Ticket Site to purchase your tickets. You may purchase online, by phone at (613) 232-6767, or in-person at the TD Place Box Office located at Lansdowne Park. Are children permitted at the festival? Yes! Children who are 9 and under do not need a ticket when accompanied by a parent who has valid accreditation to the festival (ticket, pass, etc.). We have a kid-friendly BSOMA KidZone in the park with fun activities during the weekend afternoons. Please bear in mind the festival can be a loud and crowded atmosphere, so we recommend bringing earplugs and planning a meeting spot in advance in case of separation. Parental discretion is advised for some programming – please ensure you are familiar with the acts scheduled to play. Volunteer-specific FAQs are here. Registration opens July 18th, 2018 at 12:00 PM. Please be aware that shows may feature strobe lights, loud noises, and other visual and physical stimuli. We encourage patrons who may be adversely affected by these elements to look into the artists’ live performances (including audio/video) and to plan accordingly. Patrons with a disability who require an attendant can bring one attendant to the festival at no extra cost. The patron (with a paid ticket) and attendant can obtain the accessibility pass at the festival gates. The Ogilvie Subaru VIP Zone is not wheelchair friendly due to reserved seating in place. We recommend patrons in a wheelchair purchase GA and use the separate viewing platform specifically designated for wheelchairs. Please read our Accessibility Policy for more information. What is in the Ogilvie Subaru VIP Zone? Single day Ogilvie Subaru VIP passes are assigned seating. A row and seat number will be issued during purchase. Full festival Ogilvie Subaru passes are to the ground-level lounge and do not have assigned seats. Lansdowne Park is well served by OC Transpo Routes 6 and 7. To Plan your trip using transit, use the OC Transpo Trip Planning Tool. Your event ticket to CityFolk is also your free ticket to ride OC Transpo! We encourage CityFolk festival goers to use alternate modes of transportation. Underground parking at Lansdowne is available but may be limited. CityFolk festival goers are encouraged to carpool or take alternate modes of transportation such as transit, taxi, cycling or walking. For more information on parking at Lansdowne, please visit the TD Place Website. Nearby parking is also available at the City of Ottawa parking facility located on Bank Street and Second Avenue. Please visit http://ottawa.ca/en/residents/transportation-and-parking/parking for more info on City parking facilities. Your transportation options are listed in detail on our Directions page. ADVISORY NOTICE: UNDERGROUND PARKING WILL BE LIMITED. Share your space. Fold chairs when not in use. Please don’t block paths or entrances. Note – there are no lawn chairs allowed at the RavenLaw Stage due to space limitations. Thanks for your cooperation! RavenLaw Stage inside the Aberdeen Building has limited capacity. If you plan to see a certain show at RavenLaw, be sure to get there early for your best chance at securing a spot. Space will be available on a first-come, first-served basis. This is an outdoor event, rain or shine. If significant weather delays are anticipated, we’ll let you know through announcements on our social media and at the festival. Band and festival merchandise will be available to purchase at the Merch Booth located inside Aberdeen Pavilion, next to Main Gates. Here’s an opportunity to wet your whistle with a variety of craft beverages! Stop by inside the Aberdeen Pavilion and try something new or get reacquainted with your favourite. Check out the selections available at the Mill Street Craft Beverage House. Non-alcoholic beverages will also be available. No homebrew allowed! Remember that only sealed (non-glass) beverage bottles are allowed through the gates. Amenities to make your life easier! Locations will be indicated on our site map. Refillable water stations so you can keep hydrated. First Aid Tent – don’t hesitate to visit or ask for help if you need it. Info Booth and Accessibility Team – these cheerful faces can answer your questions and provide accessibility assistance. Portable Toilets and Handwashing Stations – self-explanatory, really. The festival grounds are a non-smoking area. Security will be conducting bag checks at the gates and walking the grounds to foster a safe environment. If you require their assistance, absolutely do not hesitate to let them know. NO Bicycles inside festival grounds. Valet bike parking is available onsite. Where is the Festival Box Office? The Box Office is located at TD Place, at the end of Exhibition Way. You can purchase passes here with cash, debit, or credit card. Box Office opens at 4 PM on weekdays and at 2 PM on weekends, and closes 15 minutes into the headlining performance. Plan ahead and get your tickets early! What is the festival Will Call? The festival Will Call window is where pre-purchased, guest list, and complimentary tickets can be picked up prior to entering the festival. It is located in the Box Office at TD Place. Will Call opens at 4 PM on weekdays and 2 PM on weekends, and will close at 10 PM all nights. If you have made arrangements to pick up your passes prior to 4 PM on weekdays/2 PM on weekends, you can do so inside the TD Place Box Office. Please bring your order # and photo ID to our Will Call window to pick up your passes. IMPORTANT! the name on the account must match the photo ID of the person picking up the pass. The main gate is located inside the west side doors of the Aberdeen Pavilion. IMPORTANT: Please remember to scan out whenever you leave the festival site. Gates open at 5 PM on weekdays and 3 PM on the weekend. info@cityfolkfestival.com is the best way to reach us with other questions. We highly recommend that you email us. You can also send us a DM through Facebook/Twitter. We love all your comments, so please keep ‘em coming! Send an email to info@cityfolkfestival.com with your full name, your contact information and a detailed description of your lost item and we will see if we have it.